Despite centuries of sharing our lives and homes with cats, many pet owners know very little about interpreting signs of anger, fear or aggression in these creatures. The typical “Halloween cat” posture (arched back, raised fur, ears back, hissing) clearly indicates fear and/or aggression, but cats also use other postures and behaviors that are subtle and easily missed. Since a hostile encounter with a cat at some time is almost inevitable, a few tips can help you avoid injury if you find yourself in such a situation. In some cases, the signs of trouble may occur very suddenly and without apparent warning. For example, petting-evoked aggression occurs when you are petting a cat (usually while the cat is on your lap) and the cat seems to be enjoying the interaction, but then suddenly strikes out at or bites you. The most logical explanation for this behavior is that some cats have a limited tolerance for being petted, so the best way to avoid this problem is to stop petting before that limit is reached. Unfortunately, the signs preceding the strike or bite may be very subtle—flicking the tail or ear may be the only indication of a problem. Understanding what those behaviors mean may save you from being injured. Consult your veterinarian. Painful conditions, hormonal influences or other medical issues may cause your cat to be aggressive. Relieving these problems may help eliminate the behavior. Try to learn what the cat likes or doesn’t like. Some cats like to be picked up and held, but others absolutely refuse to accept this. This can seem contradictory when the same cat that doesn’t want to be picked up wants to be in your lap if you are sitting down. 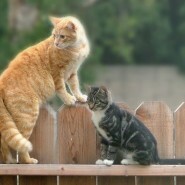 Often, interacting with cats involves negotiation—if picking up the cat is not going to work, don’t do it. Never pursue a cat that is trying to get away from you. It is already frightened; don’t make it feel threatened.